Sarah what's your background. So I've always enjoyed nature always enjoyed being outside. I decided that it was time for me to get out of the entire retail setting and so I went back to school for my sEcond associate degree and I got that Western technical college in the landscape horticulture program. I graduated ti 2016 and then by 2017 I was asked to come back and teach in the program. 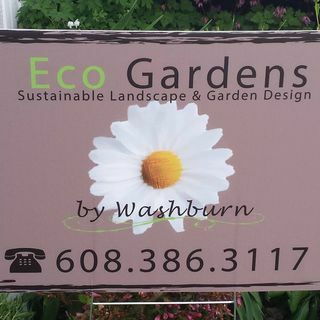 So you were able to take your love for being outside your skills that you learned teaching and ... See More then wrap that up into your own your own business with Eco Gardens. My Washburn Yeah actually right after I graduated I started Eco garden by Washburn and I thought oh boy what am I doing. Ok so I had a very good business background and a pretty good knowledge for horticulture. Every day I learn something different and I tell you bouncing ideas off people and trying to make sure that you stand by all the needs of everybody. I know you can't do it but trying it is challenging but it's fun when you actually have a lot of success at it. What are some of the service organizations that you belong to the American Legion. I'm involved with them. In fact we've been discussing some tree replacement options up at the Onalaska Legion post and though I belong to a referral group we are a group of small business owners and leaders and we get together about three times a month. We discuss what our business is doing kind of like the current trends in our business and what type of referrals that we're looking for is.